Whoo hoo! Darnell is having another NBUS challenge! and there are some wonderful prizes to be won! Every month I've been purchasing the wonderful Petite Places stamps and dies from Papertrey Ink because I just LOVE miniature things - but then don't seem to find time to get them out and play with them! 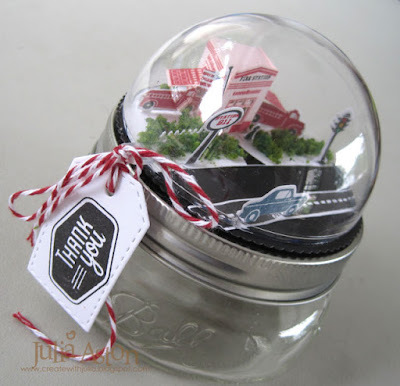 So the NBUS challenge was the perfect opportunity to get the City Station Stamps and Die set out and create this fun jar topper! We were recently invited to my nieces in-laws cottage in NH and her father-in-law is a retired fireman so I made this as a thank you to them! I filled the little 1/2 pint jar (from Joann's) with M&M's. PTI sells the 3" ornament domes and I also found them at Joann's. See the little black dog sitting outside the Fire station?! I made the tag from a Stitched Tag Die from Waltzingmouse - the Thank You, car and Stop light stamps are from the Main Street Petite Places set, the road stamp is from City Scenes. So what NBUS supplies will you get out and finally use to link up to Darnell's NBUS challenge?? Accessories: Foliage Clusters - Wee Scapes (from hobby shop), Scotch Quick Dry Adhesive, Copics, Glaze Pen - Sakura, Maraschino Twine - The Twinery, 3" diameter clear ornament dome - PTI (or Joanns), City Station Die set, School Die Set, Main St. die set - PTI, Stitched Tag Die - Waltzingmouse, 1/2 pint canning jar - Joanns, Scortape. Julia this is amazing! A little world inside that dome - I know it's easy to hypnotize me right? I love this - reminds me of all the water globes I've HAD TO HAVE over the years! SUPER idea and adorable project!!! Oh my this is amazing Julia! Fabulous project! What a perfect little thank you gift! I love all these sets too and don't take them out enough. Sure is darling and I'm sure you had fun creating. What a fabulous take on the challenge! So much interest under the dome! I love this project, Julia! Oh.My.Goodness! This is awesome! 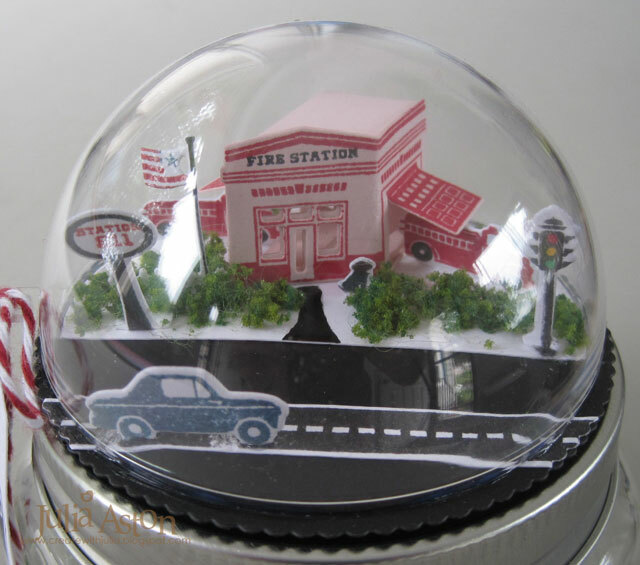 Your little firehouse scene looks so cool under the dome! What a super gift for your NIL - I'm in awe! I only make cards so when I see something like this, my jaw drops! Fabulous work! 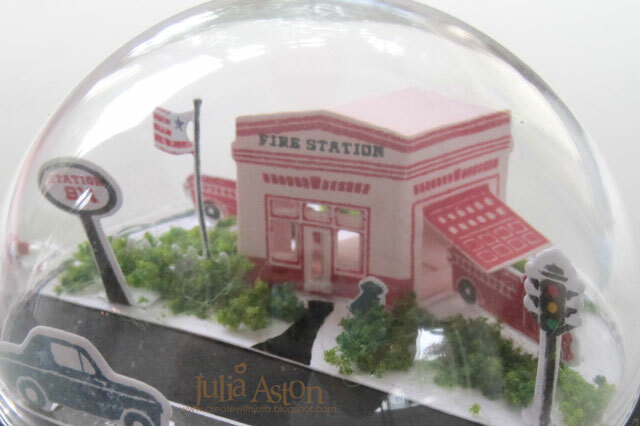 Julia, I love your fire station! It's beyond adorable, and a work of love! Haven't used mine yet either, and am glad to have your inspiration! This is so fantastic. Love yourlittle scene in the dome. I am doing the same as you have been doing....collecting and not using. Ithink I'll use Darnell's challenge to get my petite places out. M&M's are such a fun idea for the jar filler. Wow! This is so adorable! Well done! Julia, your little scene is just darling. I've never seen these jar toppers before. What a thoughtful gift! LOVE this....mine is still a NBUS too, thank you for the incredible inspiration. What a clever project Julia! I adore this!!! Adorable! I love your fire station scene - what a perfect gift for an ex-fireman. Those buildings are great, and to include the little black dog too - fab! this is gorgeous, and so wonderfully created. How adorable! I love Petite Places and the scene you created is wonderful! This is such a clever concept! Love the idea and how you turned it into a cool gift.